Today I’m going to teach you the very basic starting point of Music Chord Theory & Chord Progressions. Don’t worry, it’s easy as cake. I use a piano to play music and will be teaching my knowledge through it. This Music Theory can be applied to any instrument, but it’s the easiest to visualize on the piano. All you need is a piano, two hands, and a desire to learn. So as you’ve noticed, the piano has many white & black keys with repeating sections. And if you count them, there are 12 keys in-between each repeat. Thats 7 white keys & 5 black keys. I call this region The Main Playing Field. What determines what note you start on, is what key your playing in. In the picture here, The Main Playing Field starts on C, because we are in the key of C Major. 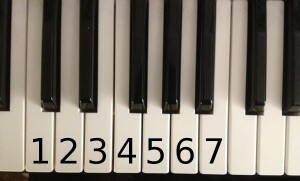 As you can see in the picture, the white keys are numbered 1-7 starting on C. So that means that C = 1 , D = 2 , E = 3 , F = 4 , G = 5 , A = 6 , B = 7. We’re starting on C because is the easiest key to start off on. They are all on the white keys. 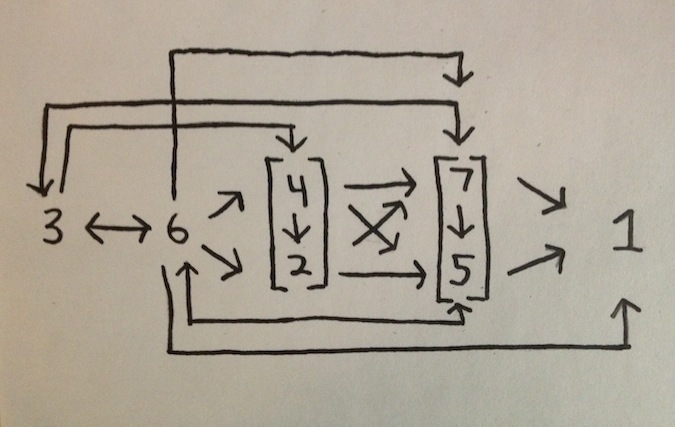 Now if you can think of the Main Playing Field as numbers 1-7, consider this next image. About 85% or more of the music you hear anywhere follows a path on this chart. More than one song can follow the same path. Ever wonder why a song sounded similar to another? Creating a path using the arrows and rules almost guarantees a perfect sounding song. 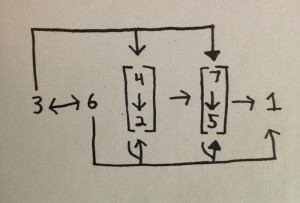 From #1, you may jump to any number. Now depending on what number your on, you must obey the direction of the arrows. The idea is to navigate your way back to #1. Now repeat the cycle and you have a song! That is your Resolution; aka. a Cadence. 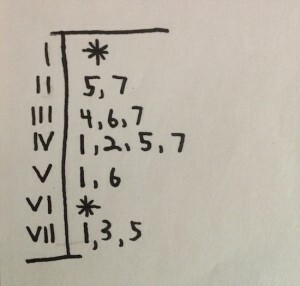 A Cadence is the build-up of notes until you reach a peak, usually on either #5 or #7, to end back at the start on #1. Now what you just created is whats known as a Chord Progression; a series of chords or notes to create a tonal effect. You don’t always have to follow the arrows, but you have to be an expert to know when break the rules. Don’t worry though, in a little bit, you’ll be an expert too. Use this chart on the right for a simpler view of the rules. The roman numerals in the left column tells you which numbers you can jump to next, in the right column. The same rules apply. You start on number one and from there it’s a wild card. You can go to any number you want. After that, depending on which number your on, you have to obey which numbers you are allowed to go to next. And the idea is to get back home at number one while following all the rules. Its exactly the same rules, its just a different way of looking at it. Finally if your really good a diagrams and charts. Here is an even simpler version of the chart; possibly too simple for a beginner. Now if this chart doesn’t make sense, then just ignore it and keep reading. It’s for people who want a simple clean chart with symbols to represent instead of explaining everything. It’s less clutter. The arrows that are filled in dark (ones pointing at 7 & 5), means that you can go back to the origin of the arrow. The little arm sticking out of the arrows (ones pointing at 2 & 5) means it has a regular arrow pointing at the entire column. Meaning it points at 4 & 7 as well. I also wanted to point out the arrows between 3 & 6. It looks like you can go back and forth to each note indefinitely, which is partially true. You can do that and then depending on which notes you end on decides whether you pick the top path or bottom path. Now why don’t you play around with that and explore what kinds of song patterns, or Chord Progressions, you can come up with. Next time I’ll explain & add a little more structure to all of this. If you have any questions or comments feel free to email me or post a comment on this page. See ya next week. How I do things is to first roll out a song as a free MP3 and chord chart. Then as I get fedabeck I’ll eventually make sheet music.One person has asked about why the sheet music isn’t free. It’s a time/skill thing. It basically takes little time and just a little skill to create a chord chart (but even with chord charts I’ve spent money to create proprietary software that changes a song into multiple keys and typesets it nicely. 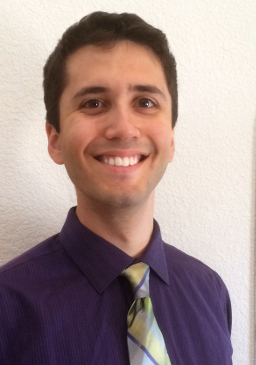 )To create sheet music takes an enormous amount of time and skill. Download a free copy of Finale and try creating your own piano, vocal, choir and orchestrated sheet music, all professionally typeset and ready to sell and then get back to me if you still think it should be free LOL! This fabulous website on music, is quite something new and interesting. I absolutely love your blog and find almost all of your post’s to be exactly I’m looking for. Does one offer guest writers to write content for you personally? I wouldn’t mind publishing a post or elaborating on some of the subjects you write with regards to here. Again, awesome site! Yeah, that would be awesome. Send me an email with details of what you would like to do and we can take it from there.